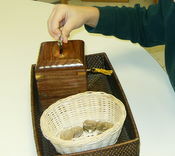 We put coins into a money bank as a fine motor activity. I bought a little wood bank with a nice key, and some coins from Oriental Trading company. This is very popular. I taught them to use two coins at first, then if that is easy, three or even more. At the end, they unlock the bank and replace the coins back in the basket, then lock it again, so there is a nice variety of hand/finger work. This is a lovely photo! Even if you don't have a money box, you can easily make one by carefully cutting a slit in a plastic margarine container or similar box. 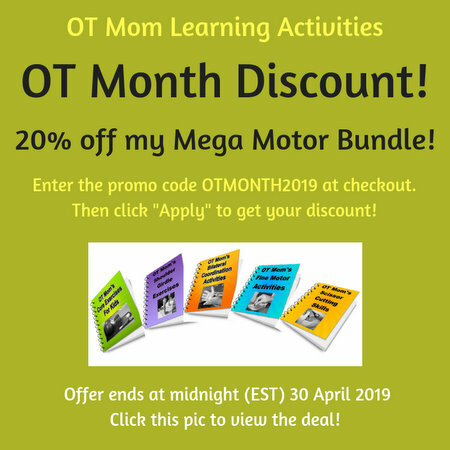 This is an easy and cheap fine motor activity that is really effective.